These days I go by one easy rule: If life gives you fruit, create a mimosa recipe! I hope this counts as one of my five a day! People, we all know I am not one to say NO to a good cocktail! Or any alcoholic beverage for that matter. With my drinks of choice I seem to go through phases just like with my foods. At the moment I have given the white wine a timeout in favor of all the summery drinks. 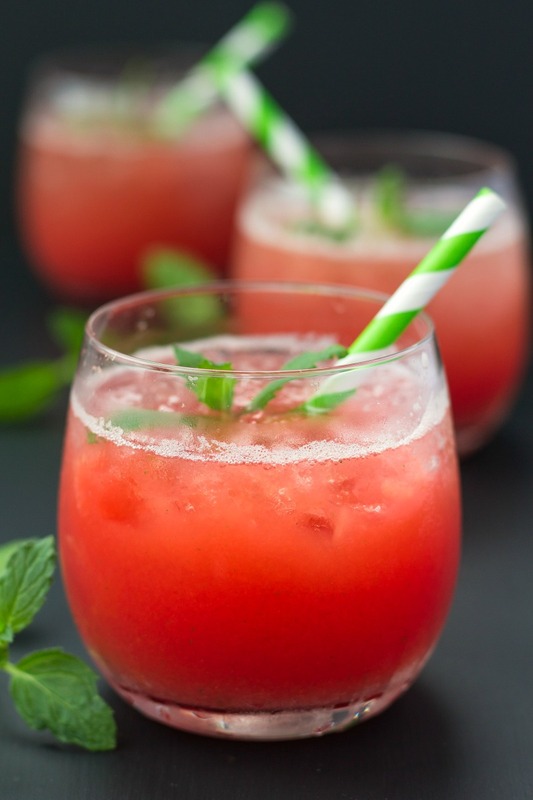 This Refreshing Watermelon Mimosa Recipe being the uncrowned queen of them all! Let’s talk summer fruits for a bit. Or rather my lack of self-control when the first summer fruits hit the shelves at the groceries in spring. A couple of weeks ago Stefan and I went out for dinner and hence inconveniently forgot to take care of lunch. Stefan never has any issues with picking up lunch on the go and I found myself striding the aisles of the organic supermarket around the corner from my workplace when lunchtime rolled around. Save to say I was positively starving and so I piled up a few staples, some new things to try (hello coconut yoghurt) and right on top the first watermelon of the year. I was really pleased with how cheap the watermelon was. Only 3,50 € for a melon in April was just such a great bargain. At the check-out I swiped my card, payed the price of a second-hand car and went back to my office. Only there I had a first glance at the bill and realized I had not payed 3,50 € for the whole melon but per kilo. All in all 9.00 € ($10) for a small medium sized water melon!!!!! I ate half of the melon and took the other half home where I tried to store it in the fridge. I know they say you shouldn’t store fruit in the fridge as it tastes less good when it’s cold but I personally despise warm melon but love ice cold one. I intended to chill the hell out of the remaining melon and then blend it up with some mint for a refreshing watermelon smoothie. But rummaging through the fridge to make some space for the melon half I found myself with a bottle of prosecco in hand that made me pause and re-evaluate the situation. A warm evening, wastermelon, chilled prosecco…. you guess right, Watermelon Mimosa action had to happen! Now that’s worth a 9.00 € watermelon! There are several reason why I love me a good Mimosa recipe but the biggest ones might be that Mimosas are always very refreshing and easy to whip up. This drink is a bit sweet thanks to the watermelon, a bit tart thanks to the lime juice and just very refreshing thanks to the mint, ice and frizzy prosecco. 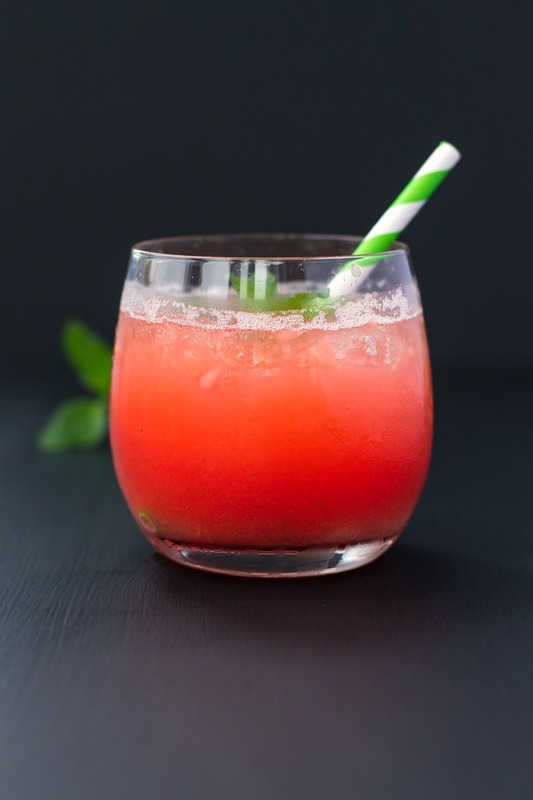 This Watermelon Mimosa is a cocktail recipe, an alcoholic beverage, but due to the low amount of alcohol perfectly suited to enjoy at a late afternoon in the sun or even along with an extended brunch. Basically it’s the perfect drink for day drinking if you’re into that kind of shenanigans. 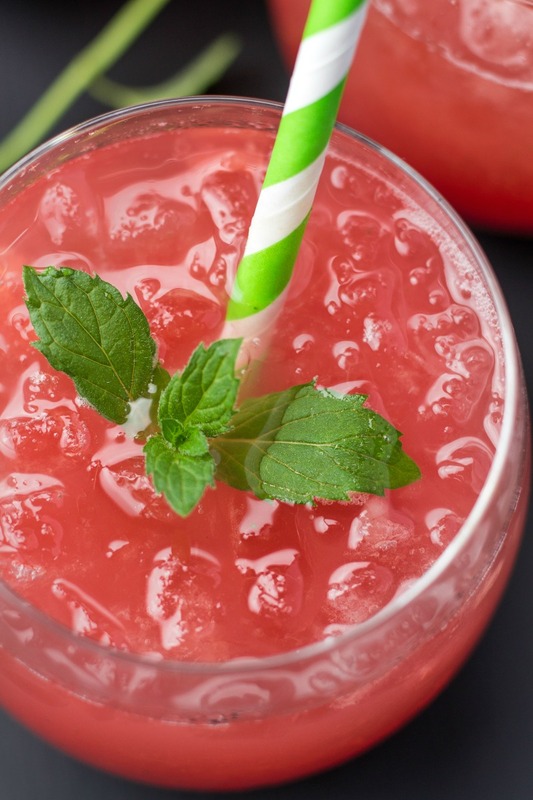 A delicious and refreshing Watermelon Mimosa recipe. The epitome of a warm summer evening and the perfect brunch cocktail! Thank god it’s Friday today so you have absolute no excuse not to stop by at the supermarket, stock up on a huge watermelon and some prosecco and whip up a giant Watermelon Mimosa! I personally will soon call it a day and start my weekend exactly like that! I swear the weekend has never tasted any better! I think that’s a fantastic rule of thumb: if life gives you fruit, make a mimosa. Also day drinking shenanigans is right up my alley. Watermelon is my favourite and I have no self control over it. When we first arrived and I found I could get it I absolutely went to town… It was such a novelty! Now I have a little more control… But if you added prosecco… That control would go out the window! Haha! Oh god – I feel like a little break right now. We don’t grow much fruit here. Berries and apples but nothing more. Our farmers markets are green and brown (all the potatos) I am always so happy to see colorful fruit stalls! Then I buy it go home and crave potatos, eggs and meat. Yum! How refreshing! Every week I post a “Friday Favorites” edition of my blog, and this week I am rounding up my favorite mimosa recipes to get ready for Mother’s Day…I am going to link back to this one for sure! !